These hiker booties are great for everyday wear and even better for walks or hikes! Made with your dog's safety and comfort in mind. Hiker boots are made with water resistant uppers, durable rubber sole bottom, and Velcro strap and zipper for secure fit. These Hiker boots are made of ultra suede and canvas with a lightweight rubber sole that's great for the hiking hound or any dog that requires style and toughness in their boot. They are suitable for walking, trekking, hiking rough terrain, the hot pavement, snow, and for protecting paws from snow melt and rough asphalt. - Light weight materials so your dog has an easy time walking, and so the boots stay on. - Durable and comfortable soles. - Zippers for ease getting on and off. Why do dogs need boots? - Keeps feet safe from coarse ground such as concrete or cement. - Protects feet from salt/sand or frostbite during the snowy winter season. 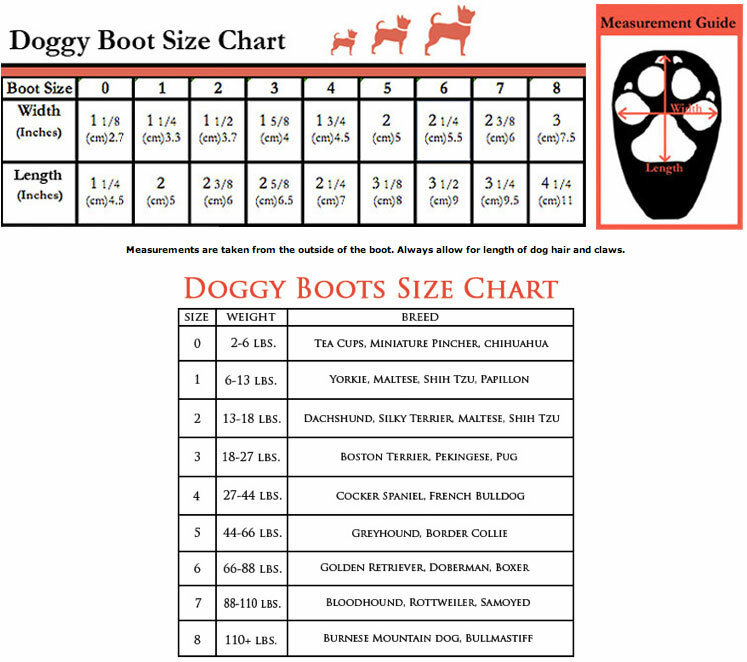 Please print out our Paw Size Chart and place your dog's paws in the appropriate paw print size. DO NOT RELY ON THE WEIGHT OR BREED ALONE WHEN SELECTING SIZE. Paw prints on size chart may not be accurate on your monitor and should be printed out. Click the button below to add the Dog Hiker Boots to your wish list.